The Interior Department is dropping its current proposal to significantly raise fees at 17 national parks—including Yellowstone National Park. According to the Washington Post, the news comes after significant feedback from the public criticizing the move. The proposal would have also sought to increase fees for commercial bus tours. The Post reports fee increases are still being mulled, but will not be as high as last fall’s proposal. The agency also said it would not institute fees for any national parks that are currently free to enter. Current proposals being discussed include a 10 percent increase to all park entrance fees as well as a $20 increase for annual/senior lifetime passes. Currently, annual passes cost $80 and guarantee access to every national park in the United States. Interior officials, including Secretary Ryan Zinke, have said fee increases are necessary to address the National Park Service’s maintenance backlog, which amounts to approximately $12 billion. Although the backlog is widely acknowledged, critics of the proposal (as seen in some of the comments below) argue that visitors shouldn’t be penalized with fee hikes, saying the NPS should receive more funding. In Yellowstone National Park, the road system and visitor facilities are under increasing stress, due to deferred maintenance and increases in visitation. Indeed, a pair of visitor use and traffic surveys published last year argue the park’s road system could be terminally poor by 2023. Environmental, recreation, and conservation organizations criticized the hikes as exorbitant, arguing it would deter people from visiting national parks in the summer and drive down revenue for the NPS. Critics also pointed out that, under the current fee structure, parks keep 80 percent of the fees they gather at entrance gates, which diminishes the impact a fee hike would have on the NPS as a whole. A study from the University of Montana’s Institute for Tourism and Recreation Research found a fee increase would result in a loss of $3.4 million in revenue for Montana, since Yellowstone and Glacier are among the most visited national parks in the country. As part of the proposal, the NPS held a public comment period. The original deadline was for Thursday, November 23, 2017—Thanksgiving—but was extended to December 22 after the agency received over 65,000 comments. 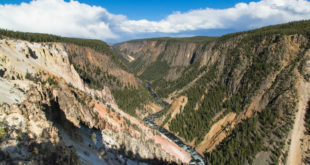 According to Emily Douce, budget director for the National Parks Conservation Association, 98 percent of the comments submitted criticized the fee hikes. Rich Dolesh, a vice president of the National Recreation and Parks Association, cited a survey from the Outdoors Alliance for Kids saying the hike would deter families making $30,000 or less annually from making trips to national parks. The survey also reported that nearly 70 percent of respondents opposed a fee hike. In addition to more modest fee increases, the Post reports that two bills moving through Congress would authorize the use of some federal onshore/offshore energy royalties for NPS maintenance work.